Hyundai Card has launched a new premium credit card for the first time in 10 years, targeting young customers, the company said Wednesday. The credit card operator earlier this month released the Green, an online application-only credit card, which offers 1 percent mileage savings for all card usage that attains 500,000 won ($447) in monthly spending, double credit benefits depending on the monthly card amount, and additional 5 percent mileage for overseas shopping. Under the slogan “My First Luxury,” the new credit card aspires to open the way for young customers to lead luxurious lifestyles, company officials explained. While cutting down on customer management cost via the online application-only system, the card company focused on expanding other user benefits, such as the Priority Pass, which offers the card user free access to some 800 international airport lounges across the world. These mileage points may be converted into the Green vouchers and used at travel agencies, duty-free shops and major hotels, within the limit of 500,000 won per year. Customers are also provided with valet parking service at Incheon Airport and major local hotels, as well as exclusive customer care centers. 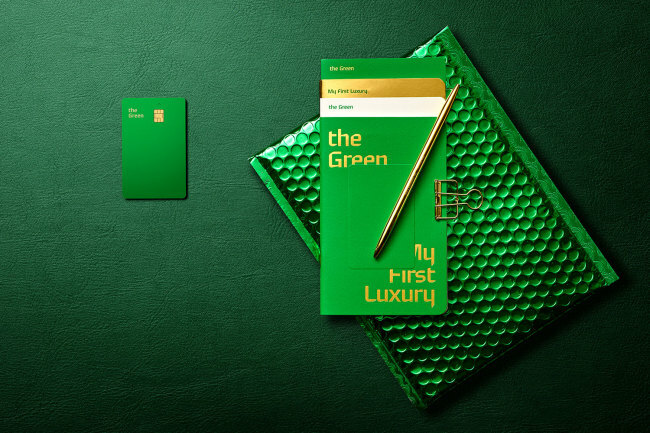 “The unconventional green color stands for the new type of luxury service that we offer for our new premium customers,” said a company official.